Renate Guttman was six years old when she was deported to the Theresienstadt ghetto, and then to Auschwitz. Her twin brother, Rene Guttman, was also deported along with her mother and father. This shadow box explains these events and happenings. Renate and Rene were always wearing match outfits; often with lace hats and gloves. Renate also wore pretty dresses with a full underskirt and pearls. Renate and Rene shared a crib in their mother's bedroom. 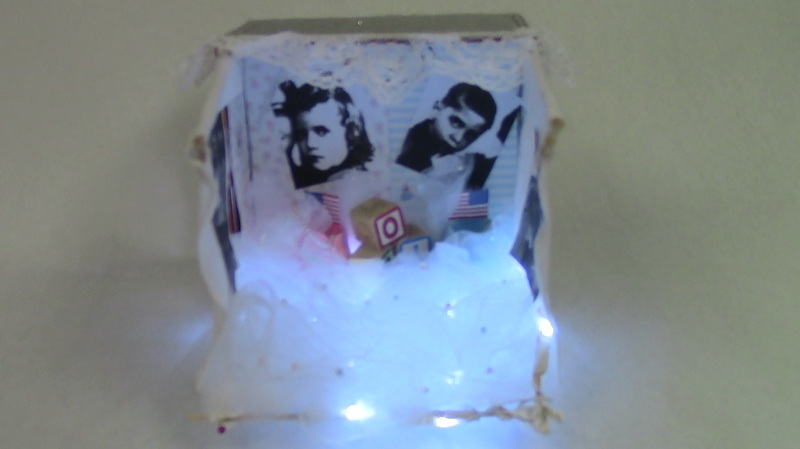 The white tool in the box is to create an image of a young child’s bedroom, the tool being their bed. The portraits on the back of the box are photos of Renate and Rene. After being captured by the Nazis and taken to camp, the twins were separated from their mother and father. This is why there are two “wallpapers” on the back wall. Upon arriving at Auschwitz, they were immediately taken to the hospital. Renate and Rene were patients of Dr. Josef Mengele. The stickers in my box represent those medical experiments. Renate Guttman was a victim holocaust at the age of six years old, and undertook the medical experiments of Josef Mengele. Because she had a twin, she became a victim for medical experiments. Renate Guttmann, who is now Irene Hizme, was born on December 21, 1937 in Teplice-Sanov, Czechoslovakia. She had two older brothers and a twin brother, Rene Guttman. Before the twins were born, their parents fled to Dresden, Germany to escape the German government policies against Jews. No information about the twins’ two older brothers is given. After the twins were born, they moved to Prague when they were very young. Before they left to live in Czechoslovakia, her father, Herbert Guttmann, worked for an import-export business. Her mother Ita (Aisenscharf) Guttmann was an accountant. From 1933 to 1939 Renate, Rene, and their parents lived in a six-story apartment building, which was along the #22 trolley line in Prague. Renate and Rene shared a crib in their parents’ bedroom. There was a steep flight of stairs that led up to their apartment. They also had a terrace that overlooked the yard outside. Renate and Rene often spend most of their time playing in a nearby park. In March 1939, the German army occupied Prague. Nothing had changed immediately, but as they got closer to 1940 and 1941, the Nazis started to arrest Jews. In the fall of 1941, Herbert, their father, was arrested by the Nazis. The twins and their mother were deported to the Theresienstadt ghetto, and from there to Auschwitz. The twins were just about to turn six years old when they were deported. Renate and Rene were separated from their mother and housed in separate barracks. Because they were twins of the opposite gender, they were sent to separate rooms in the hospital. Renate and Rene were used for medical experiments. They were X-rayed and injected. Renate specifically remembers the blood being taken from her neck as being extremely painful. She also recalls a time when she was strapped to a table and cut with a knife. The twins were used for eye experiments. The doctors put drops in their eyes to try and change their eye color to blue. This was extremely painful and could have caused the twins to be permanently blind. They were both experimented on by Josef Mengele. At Auschwitz, Renate became #70917, and Rene became #169061. When the Nazis came to take away the people who were too sick to work from the hospital, they were going to send the twins to the gas chambers. A nurse caring for Renate hid her under her long skirt, and told her to be quiet. Dr. Kalina, one of the doctors caring for Rene, took him home. Rene stayed with Dr. Kalina’s sister, Edith Mann, to escape the Nazis and gas chambers. Renate was taken in by a Polish women, Mrs. Mukha, after the Nazis abandoned Auschwitz. The Joint Distribution Committee located Renate, and took her to Bratislava. Next she went to Rubianes, France where she was put in an orphanage. There is no other information about Rene other than he moved to Kosice with Edith Mann. In her current days, she spends much of her free time making thank-you notes and birthday cards as a hobby. She does many of her works as a volunteer for The Blue Card, an organization that offers financial assistance to aging Holocaust survivors.